After a long time being unemployment, as a group of 4 persons, we sat together to see what we can do. We found that pigs are animals which most of the people are not interested in. This is because of religion and this leads to high shortage of animals for rearing and lack of their meat which currently affects many people. That is how a pig project has grown as idea for our professional future. Guideline others who want to do this project, sharing experience we will build and giving them animals (pigs) for rearing at reasonable price. Direct beneficiaries are Ndayisaba Gracien, Niyigirimbabazi Clarisse, Nsengimana Samuel and Sebyenda Leonard, who decided to start this project. People surrounding us will get different jobs in different stage of this project and all the people in general. High change in weather, which may make climate not favourable. Despite the delay in reporting the project is operating well. Next time I’ll try to report earlier. As the construction took place in spring we had a challenge with the climate: the first round of bricks (1500 pieces) were destroyed by heavy rains which highly affected our budget. For the roof we used clay instead of iron sheets, as advised by our veterinary, to avoid too high temperatures. We’ve started with 3 female pigs instead of 5 and we expect the first piglets in June. As you can see on the pictures attached it are strong and good pigs. The project has started well and first piglets are expected in June. It is not possible to provide you with invoices as the materials are both locally. I hope you trust me and that next time you’re in Rwanda you’ll visit us to see the good spending of your gift. I will soon prepare an overview of the spendings and send it to you. 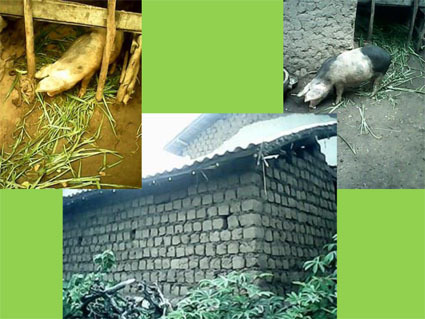 The heavy rain during construction works was a challenge but the pig farm is operational now. Despite the problems with the bricks, during the construction phase, the project is running smooth now. Op 4 december bezocht het bestuur van Vleugels van Hoop vzw het project ter plaatse in Gisanga, Rwanda. Sam toonde de varkensstallen en legde uit hoe het vermenigvuldigingsproject verloopt. Van de 3 worpen tot op heden werden 2 biggen gegeven aan een familie uit de omgeving (op basis van loting) en werden de overige biggen verkocht ten voordele van de begunstigden. Zoals eerder gerapporteerd werden alle fondsen gebruikt zoals voorzien. De biggen worden momenteel verkocht op een leeftijd van 2 maanden met een opbrengst van 10.000 RwFr (+/- 12 euro) per big. Het zou beter zijn de biggen 4 à 5 maanden te behouden daar dan de opbrengst 4 maal hoger zou zijn. Daartoe is het echter noodzakelijk dat er een omheining wordt voorzien waardoor de biggen zich buiten kunnen begeven. Sam zal hiertoe een voorstel opmaken. The piggery-multiplication-project is running very smooth. The piglets are currently sold at an age of 2 months with a yield of 10.000 RwFr (+/- 12 euro) per piglet. It would be better to keep the piglets till an age of 4 à 5 months as the yield would be 4 times higher then. Therefore it is necessary to build a fence so the piglets can go outside as well. Building a fence behind the pig stables, to keep the pig till an age of 4 à 5 months and to be able to have more pigs. Installation of a water tank to capture rainwater, mainly to have a reserve for during the dry season.